Wheaties boxes featuring Bruce Jenner following his 1976 Olympic triumph are being auctioned off on eBay just days after a highly anticipated interview with Diane Sawyer aired, in which he ended months of speculation by confirming he is transitioning to female. The memorabilia from nearly four decades ago seem to be a hot commodity, with bids being placed as high as $255 listed on the site. According to The Daily Mail, one Twitter user is hoping to sell his mint condition box for $500. NewsDay reports an unopened box sold for $177 since Jenner’s two-hour interview aired last Friday. Magnets and towels with Bruce’s likeness are also for sale. “This is better than a gold medal,” Cox told MSNBC at the White House Correspondents’ Dinner this past Saturday. 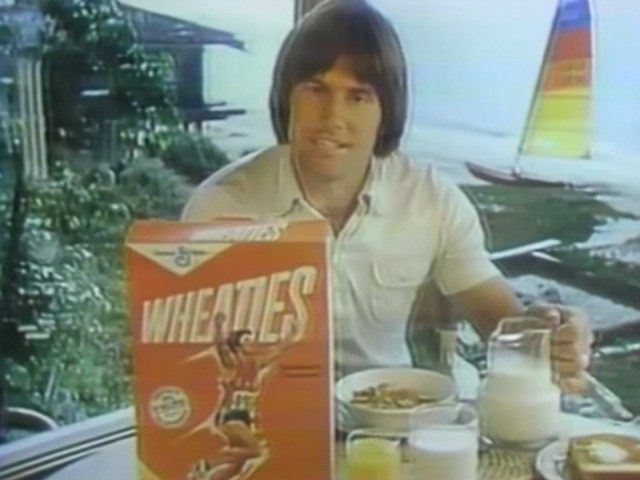 Jenner was featured on the Wheaties cereal box after he brought home Olympic gold for the decathlon during the 1976 Summer Olympics in Montreal. Although the former athlete gained worldwide recognition after his win, he told Sawyer he felt alone and lost at the time because of the struggle with his gender identity. Bruce also explained to Sawyer during the interview why it would be his last appearance as a man. Several Twitter users have asked General Mills to put Bruce on another box of Wheaties, as they suggest she’s now an even bigger champion in their eyes. Please consider putting Bruce Jenner back on the Wheaties box. Bruce has, once again, risen to the level of champion. I remember eating Wheaties as a kid and hoping one day I would grow up to be like Bruce Jenner. I still do. You wanna know what I love on my @wheaties box? The transgender Olympian superstar #BruceJenner!